The size of this group has changed little over the past four years, despite ongoing government and social service programs to encourage internet adoption in underserved areas. But that 10% figure is substantially lower than in 2000, when the Center first began to study the social impact of technology. That year, nearly half (48%) of American adults did not use the internet. Internet non-adoption is linked to a number of demographic variables, including age, educational attainment, household income and community type, the Center’s latest analysis finds. For instance, seniors are much more likely than younger adults to say they never go online. 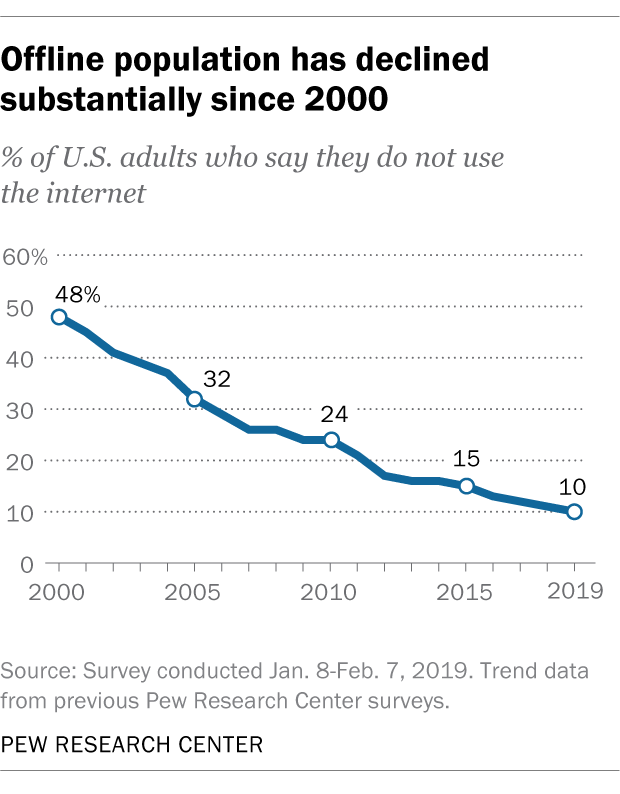 Although the share of non-internet users ages 65 and older has decreased by 7 percentage points since 2018, 27% still do not use the internet, compared with fewer than 10% of adults under the age of 65. Household income and education are also indicators of a person’s likelihood to be offline. Roughly three-in-ten adults with less than a high school education (29%) do not use the internet in 2019, compared with 35% in 2018. But that share falls as the level of educational attainment increases. Adults from households earning less than $30,000 a year are far more likely than the most affluent adults to not use the internet (18% vs. 2%). Despite some groups having persistently lower rates of internet adoption, the vast majority of Americans are now online. Over time, the offline population has been shrinking, and for some groups that change has been especially dramatic. For example, 86% of adults ages 65 and older did not go online in 2000; today that figure has been reduced to 27%. Among those without a high school diploma, the share not using the internet dropped from 81% to 29% in the same time period. Note: Methodology can be found here (PDF). This is an update of a post originally published July 18, 2015. Madhumitha Kumar is an intern at Pew Research Center.